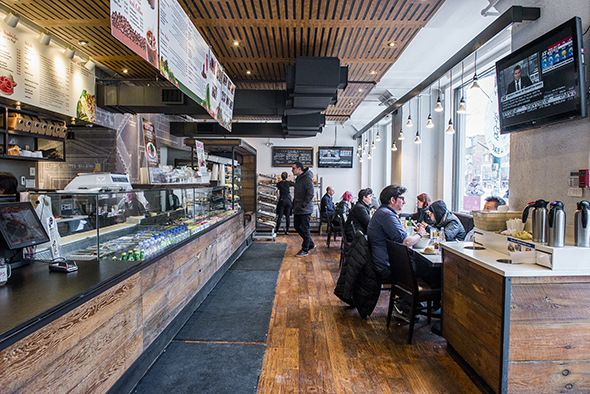 What A Bagel on Spadina Avenue is an underrated all-day brunch day destination. 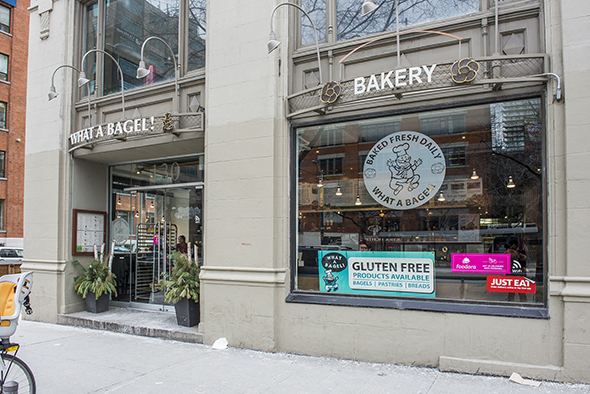 The chain of bagelrias is well established in Toronto's northern suburbs trickling south into Midtown, but were it not for this outpost (and a handful of smaller operations) there'd be even more of a hole when it comes to the availability of fresh bagels in the core. What A Bagel's offerings are bread-y but not as puffy or crusty as Kiva's , nor are they as chewy as Montreal-style bagels. 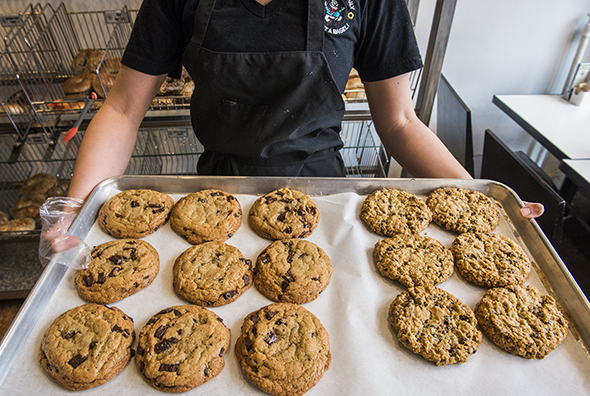 Each location does the baking on-site; it's not on display for the public, but half of the kitchen is devoted to an automated machine that sees boiling and baking happen along a conveyor belt that ensures consistency. 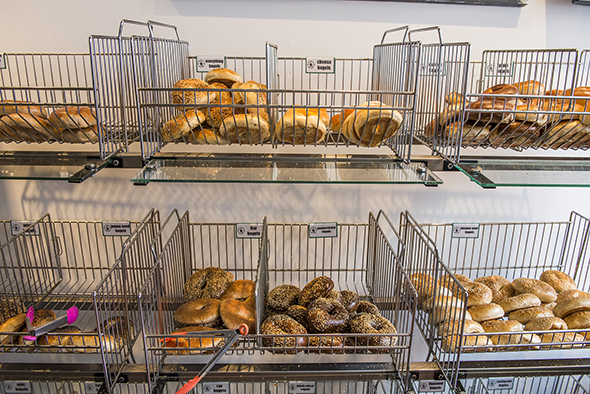 The retail bakery section is self serve, meaning customers select their own bagels ($6 per dozen or 75 cents each) from the wire bins along with loaves of bread, sweet and savoury baked goods, and classic bagel accompaniments like cream cheese and pickled herring found in the fridge. Admittedly, I'm not new to What A Bagel, but I can't recall ever dining in before today. This location offers 40 seats at cafe tables and booths, while in the summer months the patio more than doubles the capacity. I've always found the takeout counter kind of confusing; if you want hot food, queue up A.S.A.P to get your order started in the back kitchen; alternately, if you want bagels, bee-line to the retail section first to hand-select a bagel and bring it up to the counter for assembly. Coffees, juices, smoothies and shakes are available to-go, but those dining in can also opt for alcoholic drinks. There's Steamwhistle and Mill St. on tap for $5.75 per pint, plus brunch-friendly bevies like mimosas ($6) and Caesars ($7). The popular Smoked Salmon Platter ($13.99) is a beautiful thing to behold and totally splurge-worthy. 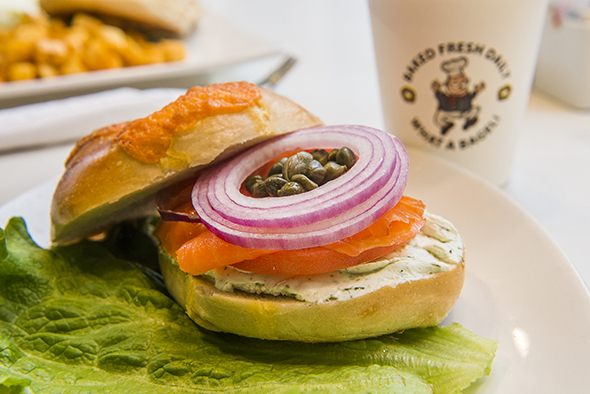 Similarly, there's The Big Shot ($10.99), a handheld version slathered with scallion cream cheese piled with lox, onions and capers. If cured fish isn't your thing, there's still ample selection. 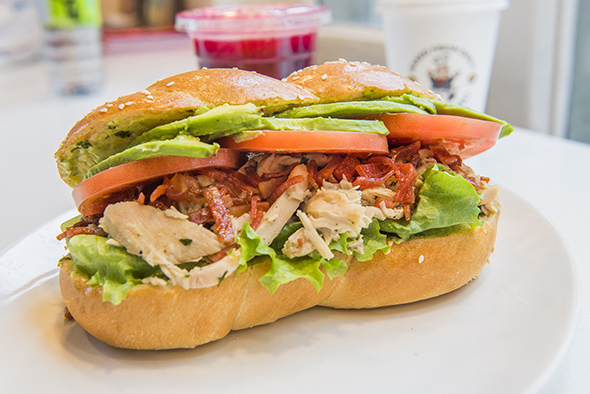 The West Coast ($12.49) is just one of several deli sandwiches built on a mini braided challah; this one is loaded with pulled chicken and turkey bacon (don't expect to find real bacon on the menu, or any pork for that matter), avocado and pesto mayo. 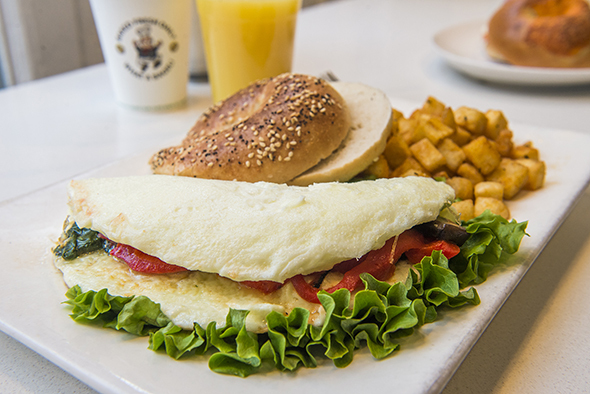 Aside from sandwiches, there's a lineup of pillowy omelettes. The Vegetarian ($11) features fluffy eggs (in this case, all egg whites, +$1.50) folded around sautĂŠed mushrooms, roasted peppers and spinach. Finally, I have to mention the salads because they're just massive. I've had the garlicky chicken Caesar ($11.49) in house-made anchovy dressing many times before and found it quite satisfying but I now suspect that portions served at the restaurant might be even bigger. The Asian chicken salad ($13.99) arrives in a deep bowl of romaine with bok choy and cabbage in a sesame ginger vinaigrette. 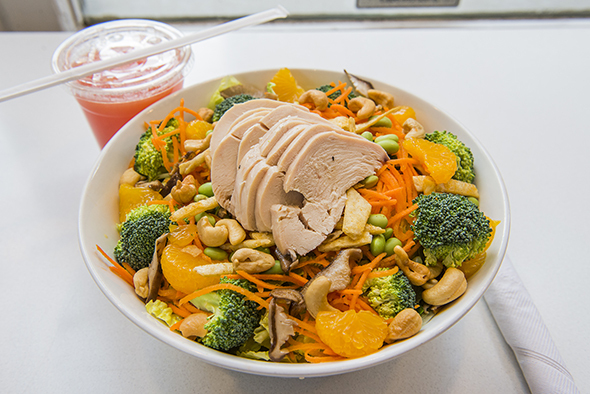 The top layer shows off a medley of vibrant ingredients including sliced chicken breast with Mandarin oranges, edamame, cashews, carrots and broccoli. 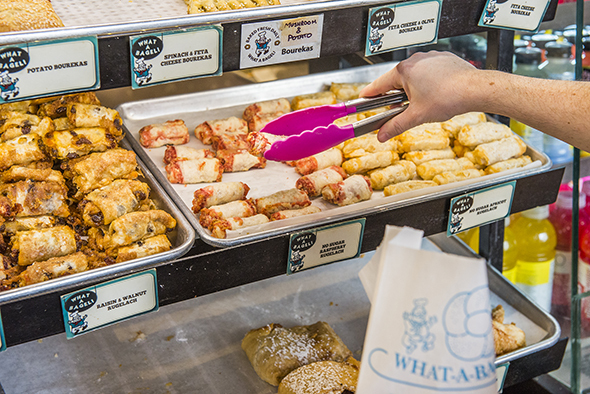 Grabbing a warm chocolate cookie or some rugelach on the way out the door is advised but don't bother stocking up on bagels unless you can commit to finishing them the same day. Like all bagels, they're best eat the same day they're baked, acceptable when toasted on day two, and inedible if you wait any longer.